One Eternal Day: "The battle...is not to the strong alone"
.... Perhaps the best example of an openly conservative Christian among the major founders was Patrick Henry. 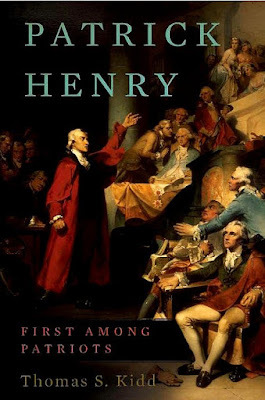 Henry, a lifelong Anglican (or Episcopalian, as they were called after the war), weaved faith into his speeches in a way that resonated with rank-and-file Patriots. Perhaps that is why Henry became the most inspiring orator of the Revolution: he knew how to speak the people's language, and during the Revolution, that was a language shaped by the Bible. Thirty years before the Revolution, the revivals of the Great Awakening had shaken the colonies and converted thousands to evangelical faith. Henry himself had been profoundly influenced by the revivals as a teenager, and later, many said that he spoke like a preacher. Henry's most famous speech, the "Liberty or Death" oration, came in 1775 as Virginia was considering whether to take up arms in light of the British threat against American liberty. The speech, delivered at Richmond's St. John's Church, was a politicized version of a revival sermon. No highbrow political theory or Enlightenment philosophers were in it, just moral exhortations delivered in the literal language of the Bible. .... Sir, we are not weak, if we make a proper use of the means which the God of nature hath placed in our power. Three millions of people, armed in the holy cause of liberty, and in such a country as that which we possess, are invincible by any force which our enemy can send against us. Besides, sir, we shall not fight our battles alone. There is a just God who presides over the destinies of nations, and who will raise up friends to fight our battles for us. It is in vain, sir, to extenuate the matter. Gentlemen may cry, "Peace! Peace!" — but there is no peace. The war is actually begun! The next gale that sweeps from the north will bring to our ears the clash of resounding arms! Our brethren are already in the field! Why stand we here idle? What is it that gentlemen wish? What would they have? Is life so dear, or peace so sweet, as to be purchased at the price of chains and slavery? Forbid it, Almighty God! I know not what course others may take; but as for me, give me liberty, or give me death! Column: Founders would say 'In God We Trust' – USATODAY.com, The History Place - Great Speeches Collection: Patrick Henry Speech - Liberty or Death!